Save an extra CDN$ 9.25 (41%). Buy the Kindle Edition instead. Comment: Family owned bookstore since 1961! Marie Curie, nicknamed “Manya” by her family, reveled in reading, learning, and exploring nature as a girl growing up in her native Poland. She went on to become one of the world's most famous scientists. Curie’s revolutionary discoveries over several decades created the field of atomic physics, and Curie herself coined the word radioactivity. She was the first woman to win a Nobel Prize and the first person ever to win in two different fields—chemistry and physics. Marie Curie for Kids introduces this legendary figure in all her complexity. Kids learn how Curie worked alongside her husband and scientific partner, Pierre, while also teaching and raising two daughters; how this intense scientist sometimes became so involved with her research that she forgot to eat or sleep; and how she struggled with health issues, refused to patent her discoveries (which would have made her very wealthy), and made valuable contributions during World War I. 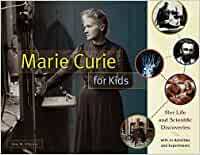 Packed with historic photos, informative sidebars, a resource section, and 21 hands-on activities and experiments that illuminate Curie’s life and work, Marie Curie for Kids is an indispensable resource for budding scientific explorers. Kids can: examine real World War I X-rays; make a model of the element carbon; make traditional Polish pierogies; and much more. Start reading Marie Curie for Kids on your Kindle in under a minute. Amy M. O’Quinn is a former teacher and a freelance writer who has contributed to many educational publications, including Jack and Jill, Learning Through History, Guideposts for Kids, Highlights for Children, The Old Schoolhouse Magazine, Homeschooling Today, and others. She lives in southern Georgia. 5.0 out of 5 starsVery well written for kids! Love this book! We are a Polish family with two girls 8 and 12 and have really enjoyed reading this together. The kids are learning about science along with the history of Poland and this amazing female scientist. Marie Curie sets a wonderful example for young girls. Love her story and this book in particular! Wonderful book, quality non-fiction material. Well-written and thoroughly researched. Excellent for middle grades and up, with nice experiments and interesting sidebars that extend its usefulness. 5.0 out of 5 starsWonderful person, wonderful book! This book is amazing! I got it for my daughter and she loves it. 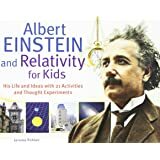 The activity guides are great and it is so wonderful for her to have a well written book like this about a great scientific female role model. It had more than enough information that I was looking for to use in my classroom. A great book for all teachers to use as a resource and a great read for all kids! So many great yet simple experiments to try!